A boutonniere is a must-have accessory for every groom and sometimes for groomsmen too. Most of grooms prefer floral boutonnieres that somehow match the bridal bouquet but whimsical and unique boutonnieres can be a nice idea to stand out. There are many types of non-floral boutonnieres – here you may see succulent, greenery or herb ones or really whimsical boutonnieres of various nerdy figurines and elements that hint on your wedding theme and style, for example, shells for seaside or coastal weddings. I’ve prepared a whole bunch of tutorials to make a non-floral boutonniere, take a look and get inspired! 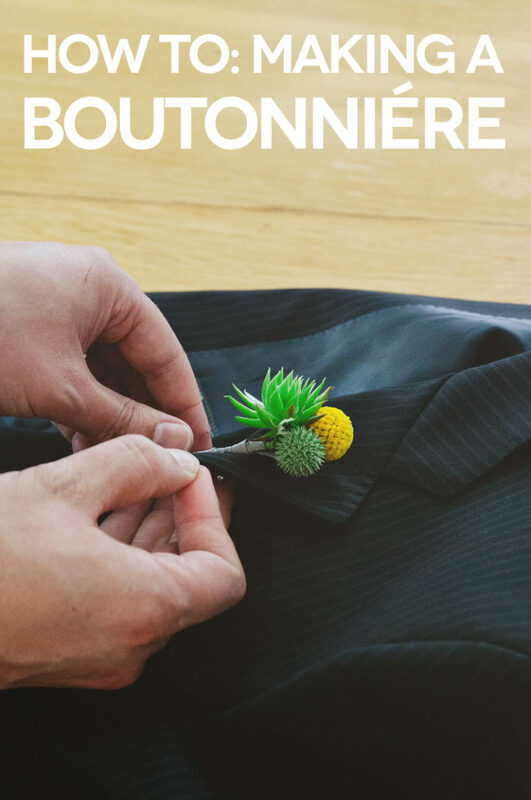 Try making your own boutonnieres for your wedding? It can be a little tricky but if you practiced before the big day you could definitely DIY. 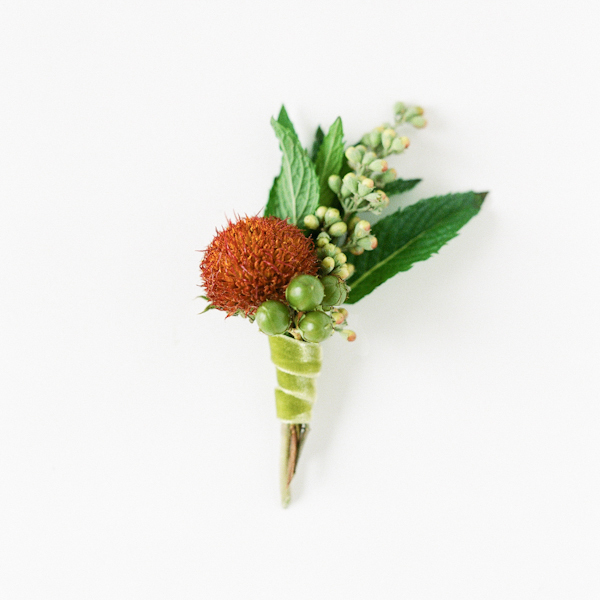 This little piece contains coneflower, mint, butterfly bush, crepe myrtle and a green ribbon, and this boutonniere is a cute and adorable piece, which is ideal for a woodland or non-flower wedding. Creating a boutonniere out of succulents is so simple and so unique! Succulents are very trendy for home and wedding decor currently, and they look much whimsier and more interesting than blooms. Such an idea is a variative and bright way to go because there are a lot of succulents to pair with each other, they have different shades and looks. You’ll need to add wire stems to the succulents to shape them right for the boutonniere. 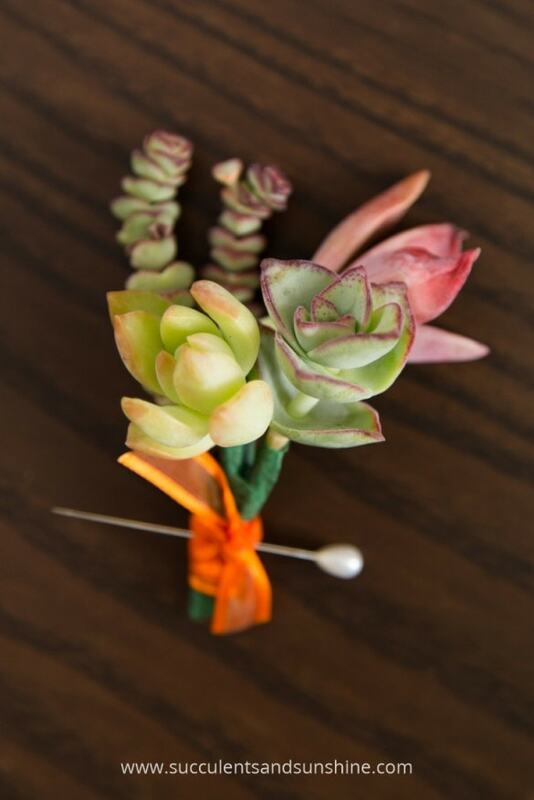 Read how to make a succulent boutonniere and enjoy! 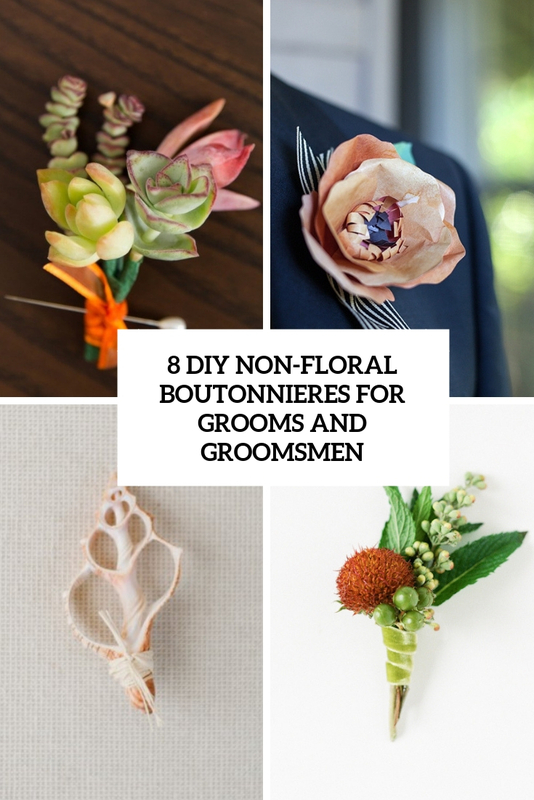 The best part about creating boutonnières is that you don’t need a ton of materials or floral ingredients. This piece includes only a green mossy ball, a billy ball, Leucadendron and some ribbon – not much and the final result is awesome! 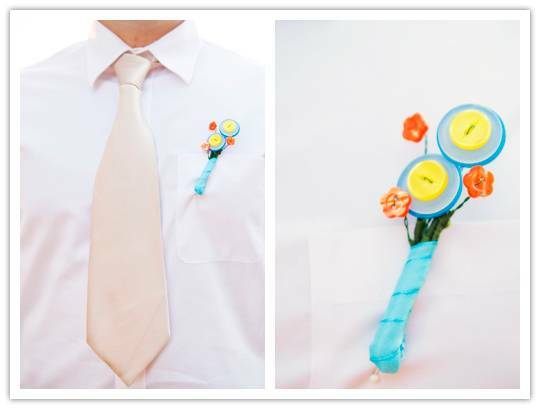 Read the whole tutorial and make your little and cute boutonniere to accent the outfit. Going for a coastal or beach wedding? 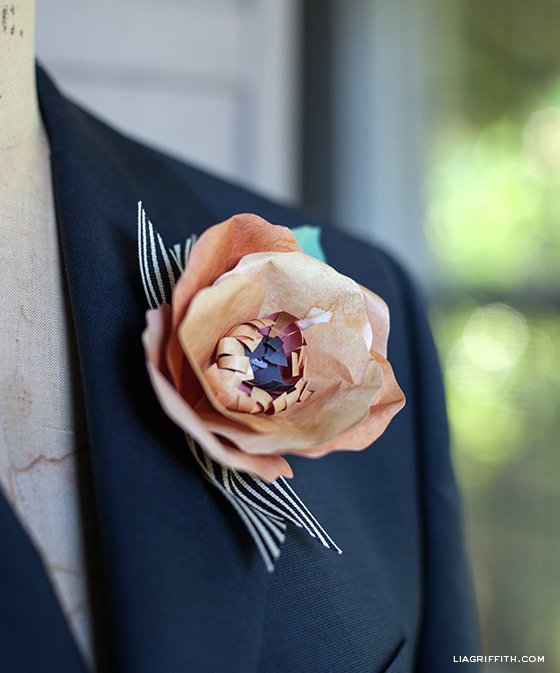 Make a matching boutonniere for your groom! This super simple piece includes only raffia, a shell, a pin back and you’ll need some glue. The boutonniere is simple and little, you can make the whole piece in just a couple of minutes. 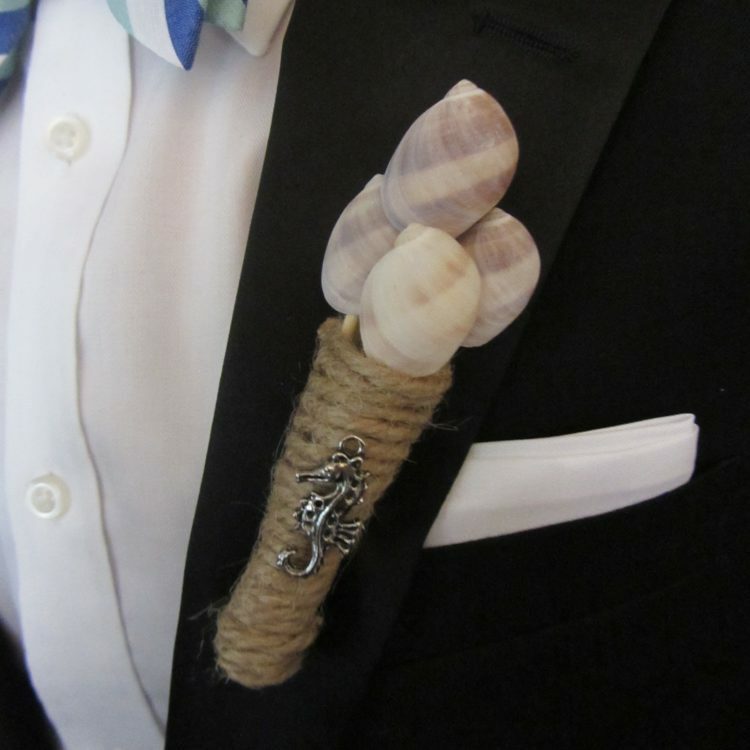 Read the tutorial and personalize your groom’s attire with a little shell boutonniere. Here’s another shell boutonniere, this time a larger idea with several shells. You’ll put them on sticks and then make a shell arrangement covering the sticks with twine. Add a little sea-themed charm to the twine to make it look good. 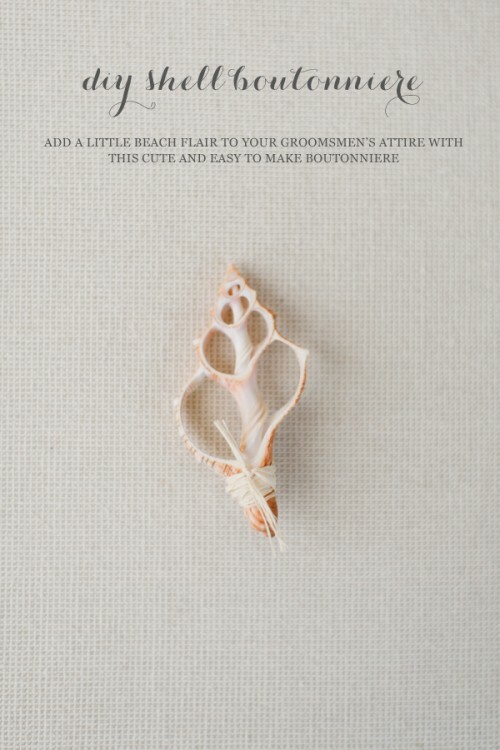 This would be an adorable, and affordable idea for a beach themed wedding! There are no real blooms here but these buttons really remind of them! The boutonniere is made of colorful buttons, some of them are flower-shaped but that’s not that necessary if you don’t have them. Use any colorful buttons that somehow fit the wedding color combo and make a little bouquet of them. Use a bright wrap to make the piece stand out even more. Voila! These wearable paper flower DIY boutonnieres are not great for a crafty wedding, and they are extremely affordable. Make some paper flowers for your boutonnieres and then just assemble the pieces – the tutorial will tell you how. These boutonnieres won’t wither, isn’t it amazing? 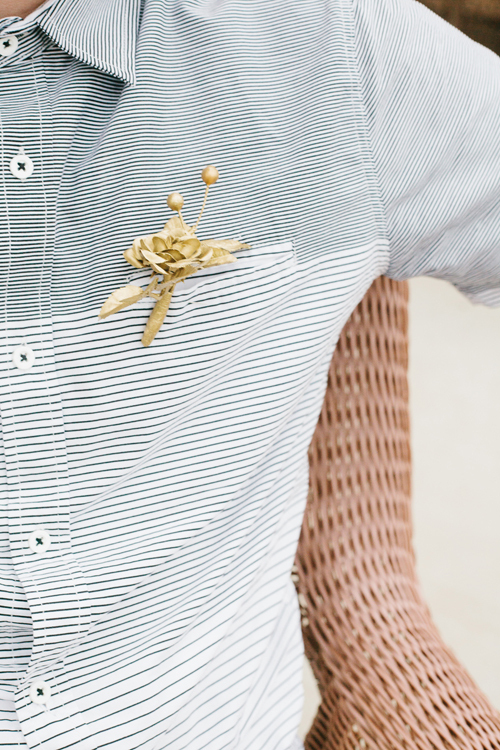 This project will tell you how to make a chic boutonniere that will last long. The piece is made of silk flowers and berries and to avoid any too cheap looks, the author recommends to spray paint it in some bold color completely, for example, in gold or pink. Get inspired!